For the discerning- a haven to revitalise and restore one's core- at the physical, mental, spiritual levels. 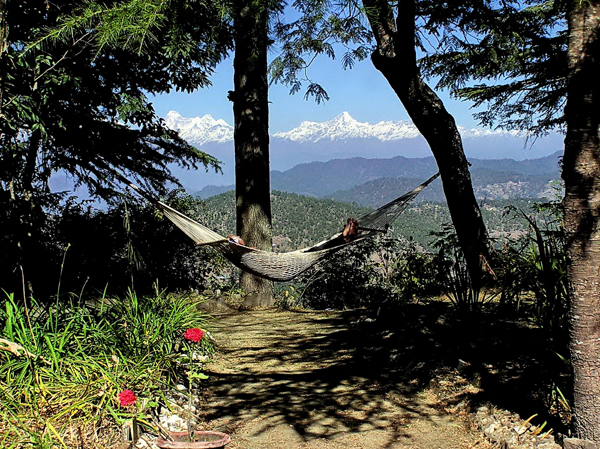 Classical Ayurveda, Yoga, Meditation and so much more in the most salubrious Kumaon Himalayas at the legendary Kalmatia in upper Almora, with breathtaking views of the Himalayas, great vegetarian cuisine, and wholesome, personalised, caring, discreet experience for individuals, couples, and entire families. Personalised, crafted to suit your personal needs and expectations. Head, for a human being, is his headquarters, housing the brain and fueling the mind. All activities of our living are governed from here, controlling the functioning of the entire body. In Ayurveda, we have an excellent treatment procedure that keeps the head strong and healthy for the entire system to be fit and healthy – Shirovasti, taking off from ‘Shiras’, meaning the crown of the head. The Shirovasti is an important therapy because, the head, for a human being, is the major workstation, engaging the brain and fueling the mind throughout. All the activities of our living are governed from here, mainly controlling the functioning of our entire body. At AyurVAID Kalmatia, we have an excellent treatment procedure that helps keep your head healthy and strong for the entire system to be fit and healthy; this revitalizing therapy is called ‘Shirovasti’. This therapy involving retention of warm medicated oil on the head for a specific period is highly effective during the Hemanth Ritu. Shirovasti is considered one of the most effective modes of external oil application. The oil is held in the cap for about 30 to 45 minutes. To be noted, we keep the temperature of the oil to a comfortable range during the procedure, after which it is drawn off and the head wiped off with a towel. Later on, an herbal powder is applied on the crown of the head to conclude the treatment. The fact that Shirovasti makes the person undergoing it strong and immune both physically and mentally is a big advantage for stressed individuals. However, this therapy focuses on the aspects such that he or she is able to tolerate the extremes of life including diseases, stress etc. On the other hand helps them overcome their health related issues, remain ageless, feel-good, look good and develop overall immunity to many psycho-somatic illnesses. In AyurVAID Kalmatia, this therapy is preceded by oelation and sudation. The Shirovasti therapy cures many disorders like facial paralysis, cataract, deafness, ear-ache, insomnia and other problems that afflict the cranial nerves. 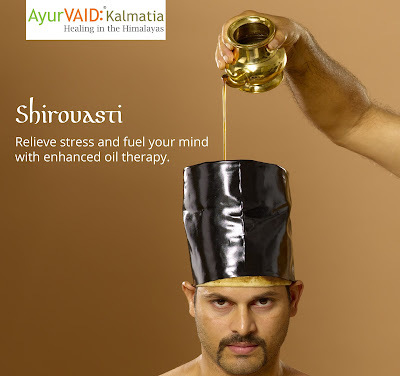 Shirovasti is one of the treatments of Ayurveda which serves both purposes. One is of curing the ailments and the other is of preventing the impending diseases. Healthy individuals should get this done once in a year or two to help their body rejuvenate and revitalize. Shirovasti makes the person undergoing it strong and immune, physically and mentally such that he or she can tolerate the extremes of life including diseases, stress etc, can overcome their health related issues, remain ageless, feel-good, look-good and develop immunity to many psycho-somatic illnesses. For those not in the know of Sanskrit, the words ‘Shashtika Shaali Pinda Sweda’ (SSPS) sounds exotic and deeply reverential. But, this process, also known as Navarakkizhi, is a celebrated Kerala specialty of treatment and considered a gift of Ayurveda to the world. To put it simply, this is a sudation-sweat inducing treatment using rice and milk to improve muscle strength, rejuvenate and revitalize the body. And SSPS? Shashtika Shali Pinda Sweda (Navarakizhi) is made up of 4 words: Shashtika meaning sixty, Shali means rice, Pinda means bolus (kizhis), and Sweda is sweat. It is a treatment in which a special type of rice called Shashtika Shali (rice harvested in 60 days and exclusively used for treatment purposes in Ayurveda), prepared in milk & processed with herbal decoction, is tied in boluses (Kizhis) and used for sweat-inducing massage treatment on the body parts which are intended to receive nutrition and strength. Basically a strengthening and nutritious treatment with extraordinary relaxing and analgesic effect, in SSPS, initially decoction of Bala Mula also known as roots of ‘Sida Cordifolia’ is prepared. Two portions of this Bala decoction are boiled with an equal quantity of milk separately. In one portion of processed milk, the Shashtika rice is cooked until properly formed. This processed rice is tied in 8 boluses, quite an interesting procedure ain’t it? Then the boluses are dipped in the other portion of processed milk and continuously rubbed deep onto the body. This is a divine feeling and you have no idea how it makes you feel unless you have experienced one at AyurVAID Kalmatia. The process – steaming treatment- continues until proper sweating occurs. We recommend SSPS at AyurVAID Kalmatia for relief from low back pain or neck pain – spondylosis or osteoarthritis of neck bone, Lumbar spondylosis, Frozen Shoulder, Cervical spondylosis, Sacroiliac Joint Syndrome or Sacroiliac Joint Dysfunction, Myalgia, GB Syndrome, Fibromyalgia, and various other types– a long list – of Neuromuscular and Musculoskeletal diseases. Navarakishi or SSPS is ideal for old (chronic) joint injuries which was not properly treated, sprained ligaments, cartilage tears, sports injuries, sprains and strains; Pains and catches in the joints and spine due to bad postures; Pain due to repeated trauma to bones, joints, muscles, soft tissues; Elbow pain due to various conditions like Tendinitis, Olecranon bursitis, elbow sprain, cellulitis, arthritis, nerve entrapment etc, and Breathing disorders. This is a promising therapy to relieve one from pain and stress. All we can say is at AyurVAID Kalmatia this is going to be a whole lot different to experience and enjoy the benefits. Call us today or visit our site www.ayurvaidkalmatia.com to unravel many such majestic Ayurvedic treatments. Cancer is the name given to a collection of related diseases. In all the types of Cancers, the body’s infected cells begin to divide without stopping and spread into surrounding tissues. We all know that Cancer is a killer disease and there are rarely mere chances of escaping it. At AyurVAID Kalmatia, we treat Cancer differently! The Ayurveda way! Our ICRP (Integrated Cancer Rehabilitation Program) is a remarkable effort and has proved its results since the beginning. In the ICRP at AyurVAID Kalmatia, we intend to minimise acute adverse effects of chemotherapy and radiotherapy through herbal medicines and natural therapies. Just to name a few with ICRP; we can reduce sicknesses such as nausea, vomiting, constipation, diarrhoea, mucositis, hair fall, skin rashes, ulcers, burns, myelosuppression, and peripheral neuropathies. We strive to improve the quality of life for each patient at the whole body and mind level. The patients get to experience improvement in the quality of sleep, their appetite, digestion, excretion etc. resulting in enhanced vitality and energy levels and then eventually lowering stress levels for both the patient and their family. If you are confused about when to enter the ICRP with us, we will make it simple for you. One can enter the ICRP before, during, or after conventional medical management. Our recommendation is to start palliative care at the earliest possible and even preceding the primary Cancer treatment. This generally helps enhance immunity, outcomes, and patient morale; it also reduces side effects and patient dropouts. • At first, the comprehensive medical assessment will be carried out as per the standard protocol in AyurVAID; this will be supplemented by an oncology-specific assessment protocol. • We then will take into account all the current medical reports of the patient. • Both primary and secondary medical management objectives specific to the patient shall be determined. • Next, a customised medical management plan which includes diet-lifestyle-medicine-treatment according to the condition of the patient and the disease, and appropriate identification of Ayurveda medicines and procedures, shall be developed with an integrative percept. • A consensus on next steps shall be arrived at with the patient, with the primary physician, and patient’s family members. • We also make sure we have the best supervision on the patient’s response to the ICRP from start through the entire treatment cycle. We will monitor this by using standard medical outcome scales such as Common Toxicity Criteria (CTC), Karnofsky Performance Status Scale, and Quality of Life (QoL) scale. Know more about our ICRP on our website www.ayurvaidkalmatia.com and also get to read the success stories on overcoming Cancer by our patients. Panchakarma is the ultimate mind and body healing experience which detoxifies the body, strengthening the immune system, and restoring balance and well-being in an individual. It is indeed the most effective healing modality in the entire Ayurveda treatments. It enables Detoxification and Rejuvenation. It is recommended to almost all individuals on a seasonal basis, as well as when an individual feels strenuous or is experiencing illness. Panchakarma will help remove the excess doshas, fix imbalances in you and will eliminate the harmful ama out of your system through your body’s own organs. According to ancient Ayurveda, good health completely depends upon our capability to fully metabolize all aspects of life, by keeping that which nourishes and eliminating the rest which don’t. When we can’t completely digest our food, experiences, and emotions, toxins start to accumulate in our body tissues, creating imbalance and ultimately leading to diseases. Exploiting these dimensions of Ayurveda which has an impact on everyday life and hold answers to present day lifestyle issues is AyurVAID Kalmatia’s ‘Sleep Improvement Program’, offered in the most blissful environs of the Himalayas. It offers you a unique, one of its kind, healing regimen of diet, lifestyle and therapy. An experience that will have you sleep like a baby every night. The professional caretakers under the guidance of expert Ayurveda Physicians cleanse your system, restore balance and stimulate your body for better blood circulation in tranquil settings. The bottom line of your experience with AyurVAID Kalmatia is ultimate, to help you attain happiness and inner peace with the best physical health for a longer and merrier life. From energy grids to sacred springs to ancient mountains, there are destinations all over the world that act as healing meccas, drawing people with the wonders they're said to possess. Now get ready to witness the most iconic of them all, the ‘AyurVAID Kalmatia’. If you're feeling worn out from the stresses of your daily work routine and need an escape into your own space, then a trip to a wellness retreat along with family or all by yourself could be just what the doctor mentioned. 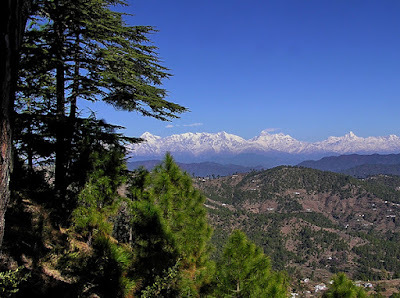 Almora’s AyurVAID Kalmatia in the Kumaon Himalayas is more than just a place for stress buster, it is the healing destination designed to address any number of specific ailments with customized programs for you and your family focused on disease reversal, revitalization, detox, weight loss, stress reduction and anti-ageing to mention just a few. Be it from anywhere around the world, from hi-tech European spas to luxurious island getaways and everything in between, but AyurVAID Kalmatia is sure to leave you feeling fully rejuvenated. AyurVAID Kalmatia, located in the Uttarakhand mountains is the undoubted destination for patients with multiple, complex, chronic, systemic diseases, seeking enduring freedom from strong painkillers and steroids, or exhausted with the challenges of poly-pharmacy; or those who wish to dodge surgeries and also those who simply wish to experience the power of the most authentic Ayurveda for chronic disease cure and enhanced health, delivered in its best professional way. 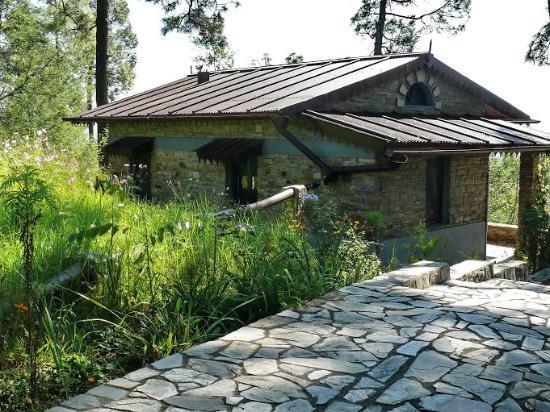 Ayurveda, uniquely personalized to suit your health needs, can now be experienced in the most salubrious of environs here. When it comes to food, we prepare the most delicious, healthy, vegetarian cuisine. This, in turn, is complemented with Dinacharya (daily health routine) and with Ayurveda therapy, including Panchakarma modules that completely detoxifies, de-stresses, reverses disease and eventually restores well-being. Experience the best in class facilities with us and witness the healing of diseases and disappearing stress levels, registering a dramatic improvement in the most pristine settings, AyurVAID Kalmatia, where the focus is on providing positive health benefits, going beyond temporary symptomatic relief. To begin with, we are very pleased and excited about the launch of AyurVAID Kalmatia, Yes! Our Kalmatia Sangam is now AyurVAID Kalmatia. The one and only Health Holiday and Healing destination, embellishing and enhancing life, located amidst the most serene and pristine locations in India. Also, AyurVAID Kalmatia is the perfect destination for patients suffering multiple, complex, chronic, and systemic diseases. Here there is not only a permanent solution but also prolonged freedom from strong painkillers, steroids, and surgeries. To those who simply wish to experience the power of the most authentic Ayurveda for chronic disease cure and enhanced health, it is delivered professionally at AyurVAID Kalmatia most luxurious way. Ayurveda holds the most reliable and effective treatment therapies for all kinds and dimensions of diseases and disorders. As old as 5000 years, Ayurveda has transformed from just being a mere instrument and method of treatment, to a lifestyle habit for many of us. At AyurVAID Kalmatia, our highly appreciated facilities such as Kutiras, Kriya Sala, Ardhachandra Rangasthala, Naivedya and AyurVANA are most prominent and effective for any stressed individual, they can choose from many of our facilities as per their needs and begin to address the transformation on a positive note. 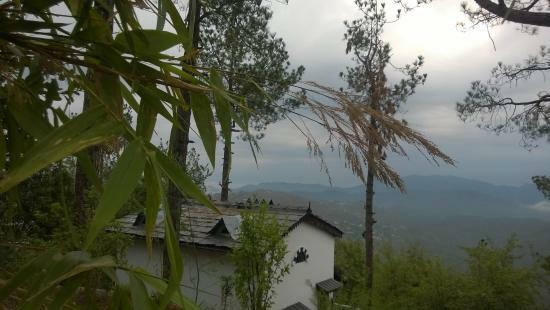 Today, this one-time resort built straddled over a lush hilltop with wonderful Mountain View is the finest Ayurveda Healing Destination in India. We are also the most luxurious and exotic practitioners offering both classical and comprehensive Ayurveda treatment in the industry. Well, most of what Ayurvaid Kalmatia is proud of is beyond mere words to explain, it is an evolution that is to be experienced and felt. We welcome all near and dear ones to come, witness the change with AyurVAID Kalmatia. For more queries, visit www.ayurvaidkalmatia.com.